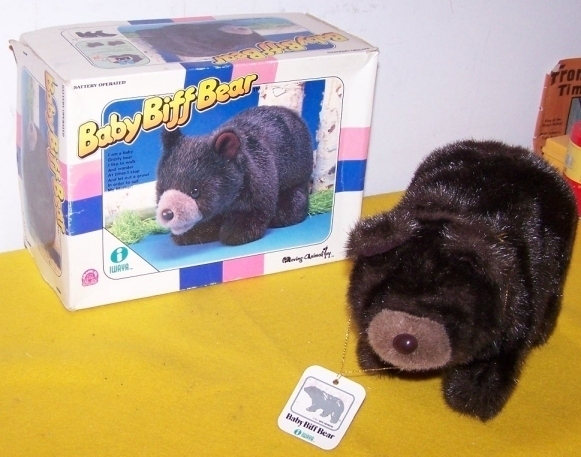 WILL SHIP WORLDWIDE ----ESPECIALLY TO THE USA Selling 1970s Battery Operated Baby Biff Bear -Walks And Grunts- Original Box New - Works Great -Size:11inchX7" Takes 2C batt. * Will combine to save on ship. cost.- Many others like it Listed. Comes from A None Smoking Home - Many other Great Slightly Used Items Listed- Please check them out Item Sold As Seen Privately - There is no Guarantee Exchange or Returns available on this Item Ask any question before Bidding Please Item is described to the fullest of my knowledge ! If in doubt Please feel free to email me if you have any questions concerning this Item. If any delay in shipping should occur it is completely beyond my control and entirely in the hands of the Postal Agencies involved. All Deliveries go by Surface Mail Postal delivery can take 10 to 14 days in Canada or USA I Reserve the right to take up to 3 working days after payment is cleared to ship the item Shipping Cost to USA or Canada 20. . A Final Invoice will be sent to you at end of Auction Preferred Payment Options Are: Cash by Registered Mail- Money Order or Personal Cheque.